Perhaps the main news from yesterday ought to be our 2 nil win over Sturm Graz, with Robin van Persie and Philippe Senderos particularly impressing. 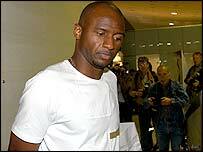 Somewhat unsurprisingly, all the focus is yet again on our “Madrid-bound” midfield dynamo, Patrick Vieira. After their initial admission of interest, Real appeared to back off somewhat yesterday, with Sporting Director Butragueno even claiming to be “a bit surprised“ by all the rumours. “A bit surprised” my arse. To be honest, Madrid’s denial is probably something we ought to worry about. Remember their claims that they would “never” sign David Beckham? In spite of all of yesterday’s speculation, Arsene remains sure that our skipper will be staying. If I’m honest, my opinion on the matter changes daily. Realistically, none of us have a clue what’s going on. We can only speculate. However, I do feel that the next couple of days will be vitally important in the whole saga. Critical, you might say. Oh, and you’ll be fascinated to hear that our midfield crisis deepened yesterday when Giovanni van Bronkhurst completed a shock move to Barcelona. No prizes for guessing what dominates this mornings papers. Apparently he’s now managed to agree terms with Real Madrid from the comfort of our lovely little Austrian training camp. The Guardian latch on to the fact that Vieira missed training yesterday, something which other papers have failed to do, and claim he is “on the verge” of completing a deal. It’s all come from that bastion of untruth, Marca. Tabloid trash? ‘Praps. But the paper does have some pretty strong ties to Real. And you know what they say – no smoke without fire. I think this story could’ve been printed yesterday, or the day before. It’s the same stuff we’ve been hearing for days and days. Personally, I’m of the opinion that Vieira will leave this week. But hey, it’s all conjecture. Today we take on the mighty Sturm Graz. The Euro 2004 players won’t be ready for this game, and it’s expected that Jeremie Aliadiere will have to sit it out. Still, lads like Reyes, Cesc, Bergkamp, Gilberto, and van Persie should all be on display. In other news, the FA are taking the piss. Real have confessed that they might be interested in buying Patrick Vieira. Apparently the transfer deadline for the qualifying round of the Champions League is on Thursday, so Butragueno’s claim that “this week could be decisive” probably holds some truth. Look at him. He looks guilty. For example, they might be a bit more red. Which is always a good thing. Especially when your blog is supposed to have something vaguely to do with Arsenal. If I’m honest, I don’t have a clue what I’m doing. I have no experience with anything vaguely technical. My usual response to a problem on a computer is to press CTRL + ALT + DLT until my fingers fall off, or, should all else fail – kick it. In other news, as I said earlier, Patrick Vieira might be leaving. To be honest, I don’t know why we didn’t pick up on it earlier. Whilst celebrating the title back in May, refusing to answer reporters in order to sing and dance to Arsenal tunes, he looked a broken man. Lots of words spring to mind when I look back on those images. There are other words that begin with “Un“. I won’t list them. The point being of course, that after last summer’s contract saga, nobody really thought that this Madrid stuff would bubble up again. But it has. Woe is us. If you’re asking me (and you are), Vieira does, for whatever reason, want to leave. If he didn’t, he’d say. With Chelsea seemingly closing in on Â£19m bargain Carvalho, and Emerson set for Juve, soon Paddy will be the only one of Real’s three big targets left.